Video analysis is quickly becoming a standard element in golf instruction. It’s common enough that slow-motion replays, along with expert commentary, are a featured segment in many TV golf broadcasts. With the proliferation of digital video cameras and mobile devices, every golfer now has access to this valuable tool. Rokform, an industry leader in mobile device accessories, recently introduced a product that they feel will make taking swing video a little more convenient. They’ve named it the Rokbed v3 Golf Shooter. 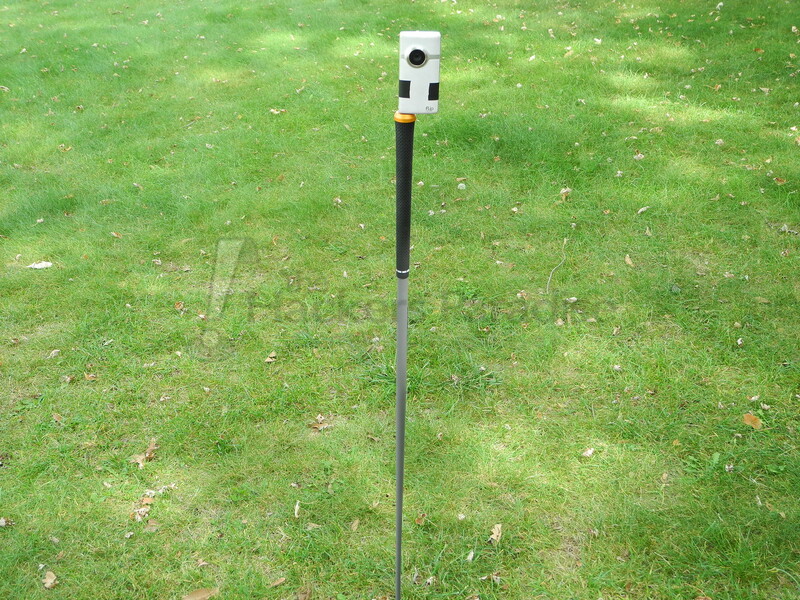 Though Rokform isn’t a golf-specific company, the Golf Shooter seems to be a logical addition to their line of products. The Rokform® Golf Shooter™ gives pros and amateurs alike the ability to view their golf swings without expensive equipment. 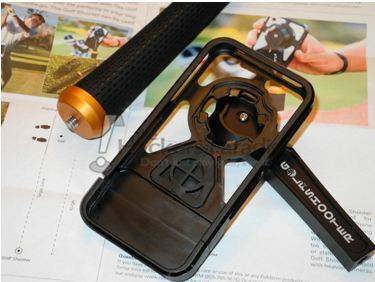 The Golf Shooter for the iPhone 4/4s lets you instantly mount your iPhone 4/4s for steady swing recordings on and off the course. 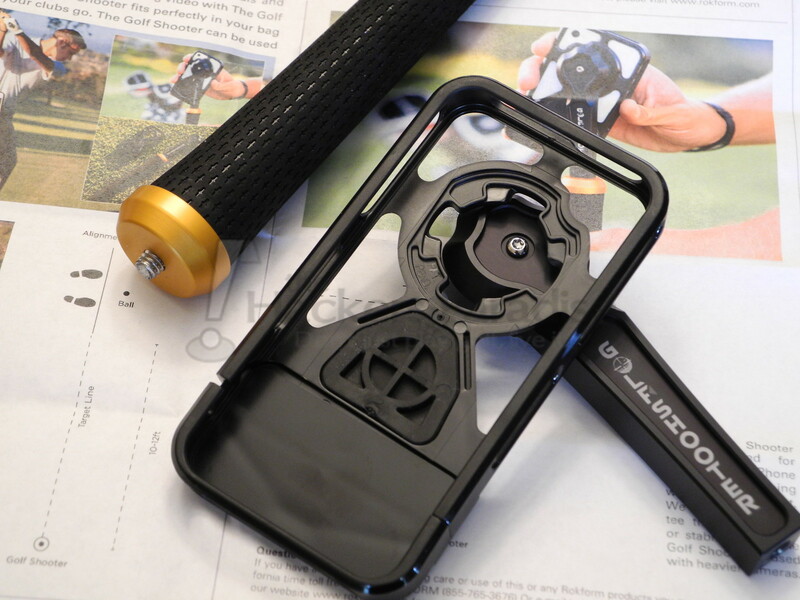 The Golf Shooter simply sticks into the turf while the iPhone is securely mounted using the award winning Rokbed™ v3 protective iPhone 4/4s case that is included. 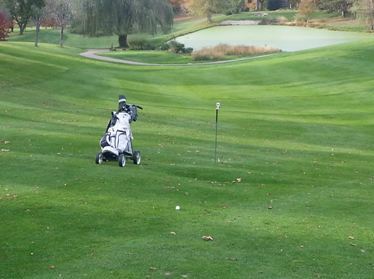 The Rokform Golf Shooter not only eliminates the need for a second person, it allows the player to get a precise, consistent, down the line view of their swing. With all the free and or low cost golf swing Aps available you can have what used to cost thousands of dollars in your bag at all times for under $130! The Golf Shooter came to me in a large cardboard tube. Upon opening the package, I realized that the base of the product was very similar to a typical driver shaft, including a grip, which explained the packaging. 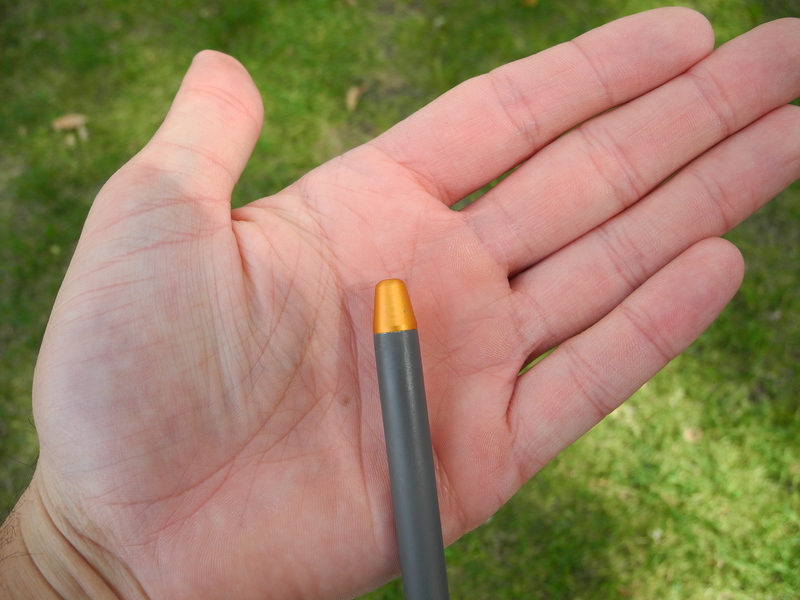 The only difference is that the Golf Shooter’s shaft is made of some sort of metal that tapers to a dull point. It’s definitely sturdy and hefty, which is a good thing, since it’s designed to be stuck down into the ground. At the end of the grip is a standard-size screw that should fit most cameras as well as the adaptor for the iPhone 4/4S case that is also included. The case itself is probably worth a review of its own, but I’ll let the mobile phone media handle that. From what I read, the Rokbed v3 case seems to be highly regarded not just as a phone case, but as a system. It has a number of accessories that allow it to be used across many activities including driving, biking, and golfing. I do want to emphasize a point that Rokform made in the instructions that came with the Golf Shooter. While the screw is likely compatible with many cameras, it’s really only designed to support the weight of something similar to an iPhone or a small digital camera like the Flip. Putting a larger camera on the Golf Shooter is not advisable and could end up causing it to fall over. The Golf Shooter exceled when it came to convenience. My previous set-up for video recording utilized a flexible-legged tripod that proved to be frustrating and inconvenient. Aside from being awkward to store, it was difficult to get a good view of exactly what the camera was recording because it was so low to the ground. In addition, it would tip over easily if there was any measurable wind. Conversely, the Golf Shooter stowed easily in my golf bag just like any other club, which made it both portable and easily accessible. I was able to simply plant it in the ground and it was extremely stable, even during some very high winds. I also enjoyed that the camera itself sat about waist-high, since it enabled me to get a good picture of the scene I was trying to capture before hitting the record button. While I don’t own an iPhone 4/4S, I have a golfing friend that does, so we tested the case using his phone. Installation couldn’t have been any easier and the case seemed sturdy without being too heavy or bulky. In fact, my friend was impressed enough that he wanted to make it his everyday protective case going forward. When it came time to put the Golf Shooter to the test, we quickly clicked it into position on the included aluminum mount and screwed it onto the shaft. The phone can be set at both landscape and portrait angles, depending on which view is desired. While I can’t speak about long-term durability, I can say that the materials the Golf Shooter is made of give it a somewhat bullet-proof appearance. The shaft itself would be extremely difficult to bend and it was very adept at penetrating the ground. The only caution I really want to communicate is that the hole you create when embedding the Golf Shooter can be enlarged by moving it around. I learned this the hard way after adjusting my field of view when I saw my camera tip over onto the ground. The deeper the shaft was placed into the ground, the more sturdy it became. The Golf Shooter’s sturdy construction left me quite impressed. Also, its portability and the convenience of being able to grab and plant it caused me to have a renaissance of sorts with a video camera that had been collecting dust. Video recording had become somewhat of a hassle since I was dealing with an inconvenient tripod, and the Golf Shooter proved to be a breath of fresh air. I was able to easily use it both on the range and the course. The case itself also supports a number of different accessories that fit into an active lifestyle, which makes it a multidimensional product. At $129.00, it is not a low-cost purchase, but the case alone typically retails around $40. I do have a couple suggestions that I feel would make the product a little more attractive, besides a slightly lower price. First of all, it would be nice to see the Golf Shooter available for purchase with a case that fits something other than an iPhone, since Rokform does produce them. Also, those people that use a digital camera would probably appreciate being able to buy it without a phone case included if it saved them $40. For more information, including ordering instructions, you can go to www.rokform.com. $130 for a stick and a screw on case? I’m sure it’s a wonderful case, but I’ll pass. Simply using the words “golf” and “iPhone” does not add enough value to justify that number. Little expensive, I will just continue to rig something up on my push cart to hold my camera. Whoa, for that much money it should have different screws for different phone/cameras. Or even maybe a tri-pod design for heavier phones. Very interesting review of a product that many THPers could make great use of, but as noted, the price point seems out outweigh the need for me. I can certainly understand why they’ve focused on the iPhone as well, but as someone who is currently moving away from one, I can appreciate the value in having some variety. Nice review Ryan, I believe it is a solid product that works very well for the intended purpose but the price point is just way too much for what this actually is. Great review, Hawk! A very useful piece of equipment for sure that will appeal to a lot of golfers, especially those looking to show off their course are look at their swing. Well done! Cool product and great idea but way too expensive. Regardless, good job with the review and thanks for taking the time. Wow, that’s about $100 too expensive! This is the iPing cradle on a stick. I could literally build this for twenty or thirty bucks. Solid review as always, though! That was an excellent review Hawk!. I guess I am with most here on price point. But..either way..I think its a wonderful idea. I like the idea. So do you have to provide the shaft it comes on or did it come with that. I missed that part. Also, wish it was compatible with more phones and maybe fit on standard alignment rods. Ingolfer speaks the truth, little expensive for what your getting. Yes, the shaft is included. Great review Hawk, this is definitely a product that I know a lot of THP’ers could get great use out of. Think of how much better all our HOTD Video Edition posts would be! I think they could have lowered the price a little, seems a little high but I’m guessing they’re really the only ones with this sort of product so they can dictate the market price to a point. Will they expland to other phones or even the iPad and now iPad mini? Seems like they are excluding a good bit of the “other” market. I like the idea but which it was in the $50-75 range. Maybe something teaching pros could use as well. Good idea; but too expensive for what it is. Thanks for sharing Hawk. I like the product and concept a lot. But the price is going to keep this out of my golf back. I’d love to see a telescoping arm and a hard rubber case to bring the cost down. Great review as usual Ryan! This intrigues me but as you pointed out the price point concerns me. be able to in fact take valuable facts concerning my study and knowledge.